The European Alps, sometimes simply referred to as the Alps, is a group of mountain clusters forming a great mountain range that stretches through most parts of Europe. The stretch of the European Alps reaches from Slovenia and Austria in the east, all the way to France in the west, passing through Switzerland, Germany, Liechtenstein, and Italy. The name “alps” was actually taken from the word “alpes” in French-Latin. It may actually have started from one of two things, either the Latin word “albus”, which translates to “white”, or another Latin word “altus”, which means “high”. Its also possible that the name originally came from a Latin rendering of a Ligurian or Celtic term. The European Alps has many different mountainous areas that are pristine and white. The highest of all mountains in the European Alps is Mont Blanc. Mont Blanc shoots up to the cloud bank at about 4,808 meters high or around 15,774 feet. Mont Blanc is located at the part of the rocky region that crosses the Italian and French border. There are many other peaks of the Alps, including the Monte Rosa, the Nordend, Mont Blanc de Courmayeur, Matterhorn, Mont Maudit, Dent Blanche, Dome du Gouter, and the Grand Combin. As with any mountain walking expedition, ensure you have appropriate clothing: you will need walking shoes/boots and lightweight layers, plus a hat or cap in the summer. Also take sunscreen and your sunglasses (even in winter the sun can burn, especially if there is snow to reflect it). Finally, remember your camera and take a pair of lightweight binoculars. A pocket guide to wildlife may come in handy, particularly if you are looking for animal tracks. 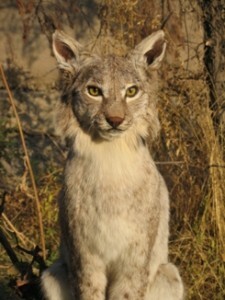 Although exotic animals such as the Lynx have been reintroduced to the Alps in small numbers, others such as bears and wolves have sadly become extinct. 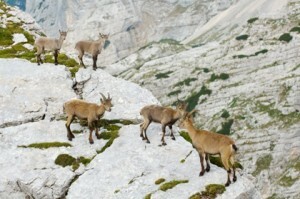 Alpine animals that you stand a good chance of spotting are the wild goats and deer. The Red Deer is the larger of the deer species, and is most likely to be seen in woodland or meadows. Roe deer are smaller and have spotted fawns. 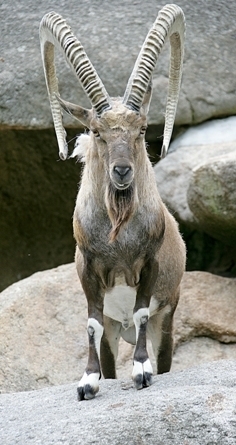 Of the goats, the Alpine Ibex tends to be larger, with curved horns, while the Chamois has distinctive pale facial stripes. You also may see smaller carnivores such as the Red Fox, Badger, Pine Marten, or Stoat. These creatures live in forested areas. The Stoat and Pine Marten look similar, however, the Pine Marten has a yellow throat patch while the Stoat has a brown coat with white underparts in summer and a white coat with a black-tipped tail in winter. Rodents in the mountains include dormice, hares, squirrels, and the Alpine Marmot. There are two species of viper in the European Alpine regions, both poisonous. The Common Viper has a distinctive zig-zag band, while the Nose-Horned Viper can be recognised by its horn. 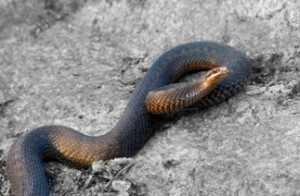 The Grass Snake is a type of Adder and is harmless. Other reptiles found in the Alps of Europe include lizards, frogs, toads, newts and salamanders. The Alpine Salamander has a black, shiny body while the Fire Salamander has bright yellow patches. Alpine bird life is rich and varied. There are a number of birds of prey that have made the Alpine regions their home, including the rare and protected Golden Eagle which lives at high altitude. The Bearded Vulture is likewise a rare and endangered bird in the Alps mountains. Buzzards, kestrels, falcons and owls are more common; indeed, the Alps are home to eight species of owl including the Eagle Owl, Long-Eared Owl, Scops Owl and Pygmy Owl. Look out too for Woodpeckers, Nutcrackers, Wall Creepers and the Eurasian Dipper. High altitude mountain dwellers include the Common Chough and the Alpine Chough; the former has a long red bill and the latter a short yellow bill. The beautiful Alpenapollo butterfly is sadly very rare and is protected. The Alpenapollo is white with black patches and with red spots outlined in black. Also protected is the Alpine Long-Horned Beetle which has long, black-spotted antennae. The Burnet Moth can be recognised from its bright red patches on metallic black or greenish front wings. What you see on any given day will be determined partly by your altitude and location in the Alps mountain range, partly by time of day and by season, and partly by luck. However, the Alps are a fascinating destination for wildlife lovers and with a little patience and determination, your efforts should be rewarded. Veronica Bow has a passion for mountain life and is a frequent visitor to the Alps in summer and winter. See more of the Animals in the Alps with an illustrated online guide to some of the top Alpine animals of Europe. Veronica’s blog, Mountain Crazy is a guide to the fascinating and unique aspects of Alpine life, including nature, cuisine, culture and tourist destinations.